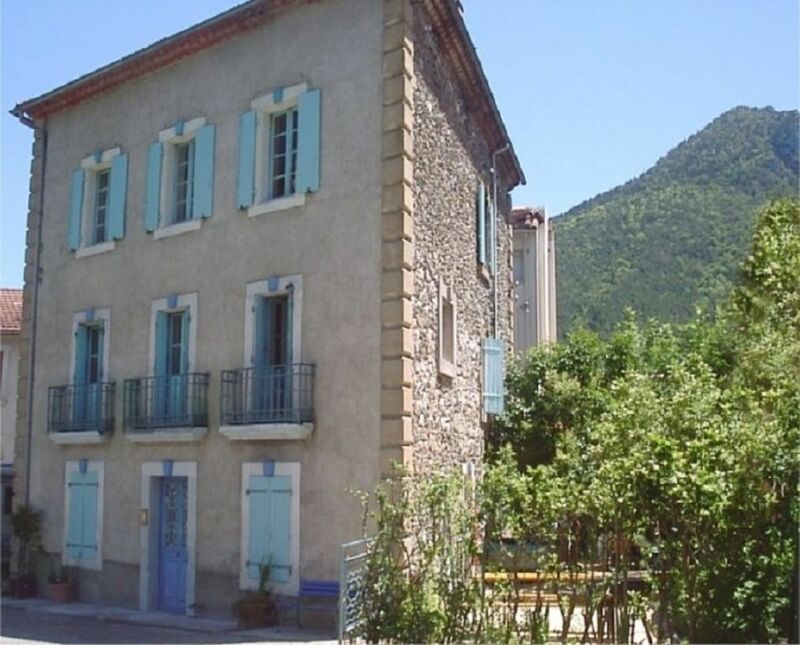 Traditional French house situated on the edge of the pretty mountain town of Axat. Private apartment spacious throughout with a comfortable lounge, fully equipped kitchen, double bedroom and twin bedroom. Attached garden with BBQ and furniture to relax and enjoy the summer evenings. River Aude runs through Axat a popular place for white water rafting and kayaking. Wonderful cycling and walking routes lead from the apartment. Surrounded by mountains the open air swimming pool, red tourist train and bouledrome are only a 2 minute walk away. Axat has a riverside bar and restaurants, boulangerie with salon de thè, well-stocked supermarket, épicerie and charcuterie. Tabac sells walking maps, fishing permits and postcards, with an outdoor café selling ice creams. Buy fresh local produce Thursday's at the town square market. Georges St Georges narrowest in the Haute Vallée are 7 mins north of the house and Gorges Pierre Lys 8 mins south. River Aude runs through the town with impressive viaducts dominating the landscape. Nearby Lakes at Quillan (15 min) Quad and Kayak hire, Puivert (31 min), Arques (41min) and Montabel (50 min). The fast flowing river Aude runs through the town with a picturesque picnic area near the bar and restaurant. The old bridge leads to a walk around the village passing the 16th century church. All kitchen essentials needed for 4 holidaymakers. Enclosed Garden with Parasol, table, chairs, bbq and washing line. Communal pool with water slide just a 2 min walk from the house. Stunning mountain views. Refreshments and ice creams on sale. Axat is set in the 12th century Cathar region, closest Chateau's Puilaurens (15 min), Puivert (30 min), Queribus (43 min) and Peyrepertuse (57 min). Thrill seekers will enjoy the fast flowing rivers of the Haute Valley gorges. Local White Water Rafting is on the doorstep. Dinosaur, hat, piano, automates museums all within easy distance. Challenging Cycle and Hiking routes through breathtaking scenery. Tranquil mountain and river locations for nature lovers. There are 87 species of orchid in Aude.